What if you could have more than enough funds in your bank account to pay the bills, without stressing about having to work extra hours to make ends meet? What if you could actually magnetically attract money that pays for more holidays, anywhere you like? What if you could pay for your children (or yourself) to have the best education you want, regardless of where and when? What if you could buy yourself life’s little (and big) luxuries any time you feel like – think a new stylish wardrobe, a nicer car, a bigger home, special holidays, jewellery, etc. What if you knew how money reacts to your thoughts, actions and beliefs and why this currently affects your ability to create abundance? And if you bear with me for the next couple of minutes I’ll demonstrate exactly how this is possible. Guaranteed no hype. No lies. No B.S. 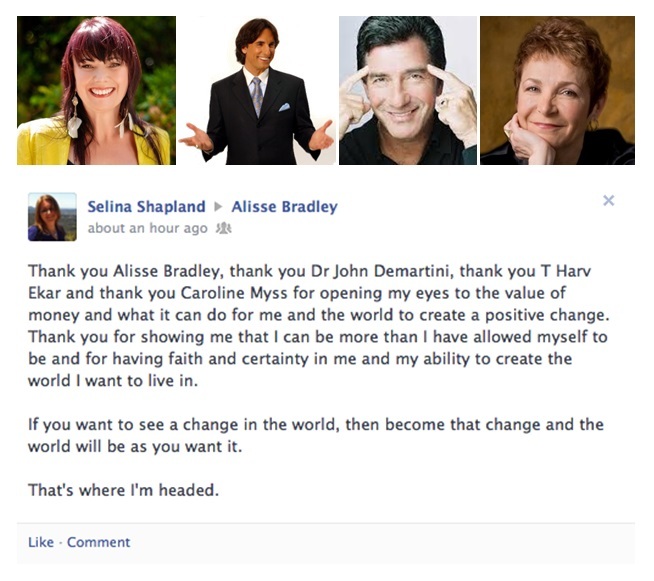 Alisse Bradley has one of the most extraordinary minds I’ve encountered. Her unique education and research and development in the areas of wealth creation, quantum physics and the power of thought is like none other. Following Alisse’s guidance I have made many changes in my business. The impact of simple things like rearranging my office, adding specific colour and following her principles of wealth creation have provided me with my best financial year to date. A weekend with Alisse is priceless. Her unique wisdom and gift for communicating it in a way you can understand makes Alisse a powerful mentor. Introducing the 6 Month ‘Wealth & Money Mastery’ Mentoring Program! Turn your finances around so that you never have to worry about how to pay your bills again. Discover your real passion and the purpose that lights up your days. Find the power within you to change your life circumstances. Treat yourself with new clothes, gadgets or jewellery – the very luxuries you currently have to forgo. Enjoy holidays at luxury resorts without having to worry about the cost. 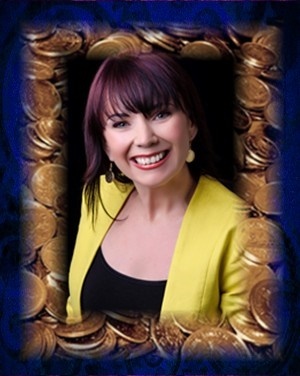 Alisse, I just wanted to thank you for your amazing wealth mastery strategies. I have been attracting incredible opportunities since I did the first unit for only one hour, and money is starting flow. Before I started this course my self-esteem was at a record low and my ability to manifest what I want and feel positive not far behind. I had no belief in myself or my gifts and felt at a loss. Every moment that you do this work changes everything in your life. I’m talking instantly. Unlike most of the programs out there it is very affordable. And it has been written in such a simplistic way I never have to worry about not understanding what I have to do. It is one of the best courses for personal growth I have examined and Alisse herself is so hands on and there to support, every step of the way. This is one of the best things I have done for myself. It hurts me to see you battling with money! Because you’re missing out on a life of abundance. You may not believe this right now, but abundance IS your birthright. There is enough for all of us to go round. You are meant to enjoy abundance in every part of your life: mind set, money, health, relationships and having the freedom to live life exactly how you want. … To change your financial circumstances! Working with Alisse helped me ‘unleash my power’ that was laying dormant within me for years. Prior to working with her, I was confused as to my direction in life and lacked self confidence. I was also unclear on ‘what’ my destiny was, though after working with Alisse, she was able to bring forth my ‘inner’ desires that I didn’t even know existed, which in turn gave me both the courage and stamina to move forward, and to bring these goals into fruition. It is an absolute pleasure working with Alisse, she has a heart of gold and is able to build a quick connection with all her clients, allowing for an amazing friendship to develop. I recommend Alisse to anyone wanting to find clarity in their life and for people wanting to take their life or career to the next level. You deserve to have an abundant and meaningful life that changes the dynamics of your future… spiritually, consciously and energetically! Money is the most spiritual thing on the planet – making more is a spiritual task mastered in the mind and expressed on the earth! The problem is: most people are not familiar with this concept –– you may be familiar with your thoughts, feelings and spirit –– but you currently lack the knowledge to generate true wealth in all parts of your life. To teach you the secrets to financial abundance. I’ve built an outstanding system called ‘Wealth & Money Mastery’ to help you view money in a different light. 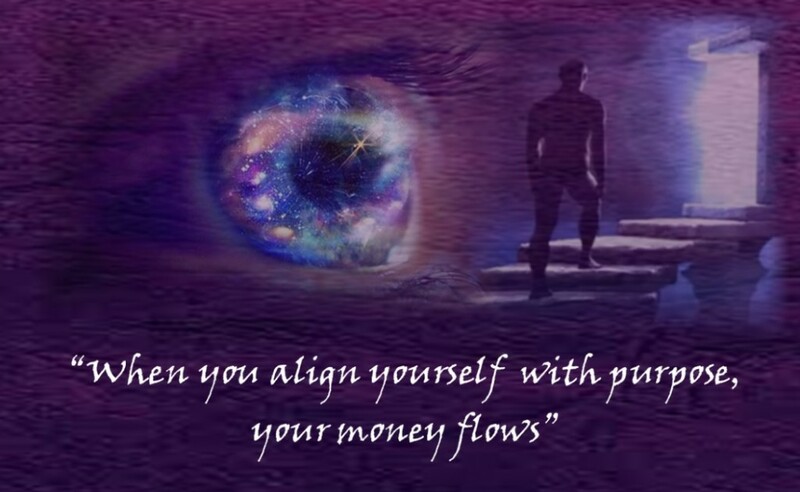 Once you know how to recognise money as a spiritual commodity it becomes something totally different – something incredibly powerful that will enable you to take charge of your financial destiny. I’ve designed this program for people like you. To help you leverage your amazing gifted-ness, your passion, and your expertise… and turn all of the above into real abundance. Our accountant came over tonight with 2 cheques to the value of $1800. Sydney here we come. We have decided to go to the Zoo before November as we now have the money. I never imagined that I would be going to the Zoo to see the first baby to be born in Australia. Amazing isn’t it. I can tick another goal off my board. The girls are so excited, out of their tree. Thankyou for today. You do an amazing job. You are sick of money being the dominating force when making decisions in your life. You wake up and go to sleep worrying about money (or the lack of it). You dream about having enough money to buy everything you desire. You desire to have enough money to be comfortable, without having to work in a job you hate. You believe that money only truly belongs to the ‘lucky’ people. Those people who are born with exceptional talent or ‘with a silver spoon in their mouth.’ You believe that the rest of us can only be wealthy if we work hard or lie, cheat and steal our way to true abundance. If you believe this, I can’t help you. People who blame others for their situation. It’s okay if you have some distress about your current situation, but this system will only work if you are willing to change your attitude! So if you’re stuck in your ways,I would like to thank you for your time, and wish you well for your journey forward. No hard feelings. Alisse, you have re-ignited my confidence to move forward in a way that truly represents who I am, a confidence to trust my inner self, and a confidence that tran-sends into the lives of others’. My sense of self is stronger than ever, and I am once again feeling happy. I am very excited for what lies ahead for me, my family and my business. Thank you from the bottom of my heart. Hi, my name is Alisse Bradley. Many years ago I was broke and desperate. I had three small children to feed and my husband and I were earning a measly $35,000 between us (annually)… times were hard. I experienced my tipping point; that helped me go from poverty consciousness to prosperity,after I had a conversation with a millionaire. I discovered that I could be abundant too… if I changed my mind about money. So I studied anything, anyone and everything – and implemented what I thought was the secret to success. It paid off – within three years we turned our finances around. During that time I studied many new subjects, gained a number of qualifications, mentored with world leaders in my field of expertise, and spent a lot of time interviewing and speaking with people on the subject of money. I even began my own Coaching Business – consulting clients – teaching them my success secrets. Alisse Bradley is one of the powerful women on this planet that is here to enlighten the world with her wisdom and soften problems with her Heart and Light. As her mentor and friend I have seen how she shares generously her insights with the world. Her work will bring you to the next level of Greatness. Her tips and information will give you hope and give you tools to reach your full potential. Enlightened Regards. It became obvious that turning your financial life around was not as simple as that. Changing your financial future is achievable, when you know how to do it. So I went back to the drawing board and researched the gaps. What happened next blew me away! Clients were finally able to turn their financial status around, and sustain it. I also became a public speaker and author. But my greatest success of all was reaching thousands of people worldwide, people like you, and helping them transform their wealth and money future. So if you want real results, and if you want a proven system that walks you through your steps – for the next 90 days – then this is for you. What’s inside Wealth & Money Mastery? MODULE #2 – Your Big Why! You are about to embark on an incredible journey, from where you are, to exactly where you want to be. In order to do this successfully, we first need to identify where you are now. You might think that this exercise is ‘a little bit of fun’ on the side of your serious wealth building tasks, however do not be fooled, this is the hidden secret that most people overlook their entire life. There is a purpose to all of life and specifically your life. In this module we will explore what that is and how you can form a strategy to support you living this purpose. This week’s module is all about identifying all the facets of living your rich life. It is a strategically sequenced process which takes you through your needs, wants, values and desires ensuring that the legacy you want to leave will be achieved. It is time for us to get precision clarity on ‘How much money you actually need.’ It is a crucial Law of the Universe that you need to know exactly what you want in order to attract that into your life. The question this week is ‘What could stop you succeeding in this program?’ You have done a lot of work getting to this point; and you are well on the road to doing everything you need to do to successfully achieve your wealth and money desires. However before we move on this is a good time to shine the light on any limiting, sabotaging and fear riddled programming that might well block your success path. From the very first day you arrived on earth you learned from your environment, we are going to now ensure that what we want is installed in your surroundings. I call this installing your ‘Success Set Up’! This week we are going to be hardwiring your success into your world. In order to make the difference we desire, this will be a 24/7 commitment, one that only the proper use of our environ-mental can offer us. It is called the power of Self Suggestion and you are going to love how this works! Fact or Fiction? The Image strongly embedded within the cells of your mind and the story it carries about YOU is the one determinant of all your results! This week we are going to check in on the visual images stored in your mind and the stories they tell! It is time to align what you want in your life with what you see in your mind. This is one of my favourite modules of all! This week we will be aligning everything you have learned, articulated and committed to, with what you actually do on a day-to-day basis. Even though I am positive your life is more enriched, the decider of your absolute success will be this. Will you DO what you now KNOW? This module will ensure you do! I’ve included a bonus module from my 6 Figure Business Builder model where I share one strategy that will make a huge difference to your business wealth and financial success. How fast has the last 90 days gone? It is hard to believe that the 90-Day ‘Wealth & Money’ Mastery Program has finished, though that does not mean that you no longer have my support. A small investment now for great gains in the future. You can get started TODAY for the investment of just 1 x $1998.. This works out to be just $5.50 per day. That’s less than the cost of your daily cup of coffee and piece of cake. If you struggle with cash flow right now, you can take advantage and choose the 12 x $198 cash flow payment plan option instead. I’d love to help you move past your current money blockages. If you let me, we’re going to build your wealth and money in the next 90 days, so you can live the life you’ve always dreamed of. You’ll enjoy your business or career more. You’ll finally be on your way to having the lifestyle you dream about. Click on the “Add To Cart” button below now. I look forward to seeing you grow your wealth and money. With the right program, system, and structure you can achieve anything you set your heart out to do. 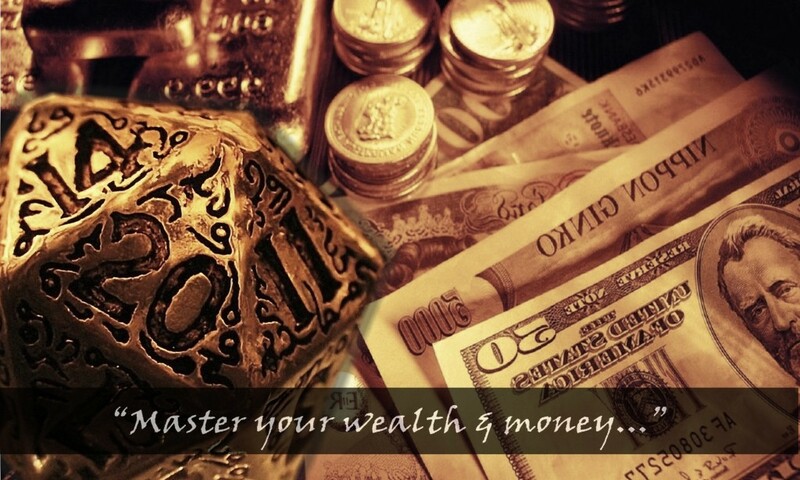 I welcome you to join me and get started with ‘Wealth & Money Mastery’ now. Alisse I’d like to share with you, I have had incredible mental clarity and drive to get things done. I’m making strong business decisions, my relationship has improved and I feel a need to wear bright colors and unusual patterns and designs. All this already, I can’t wait to see what else is yet to come.